Happy Earth Day Week everyone! This is OUR time to celebrate here at Natureworks. We love to see people from all over the world focusing on organic food and gardening methods, recycling, conservation, and generally cherishing this amazing planet that we inhabit. Thirty three years ago, when I started Natureworks as an organic garden center and landscaping service, I never could have imagined how far we would have come. Solar panels are everywhere. Every town has a recycling program. Organic food fills the stores. Families, especially the younger generation of new homeowners, totally GET IT and want ONLY organics for their lawns and gardens. I have three Smart Pots on the south side of my house. Last year I grew lettuce, then cucumbers, then escarole. 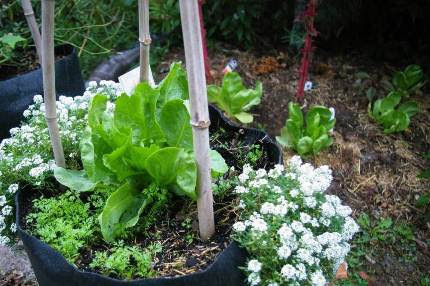 The sweet alyssum remained for all three succession plantings. 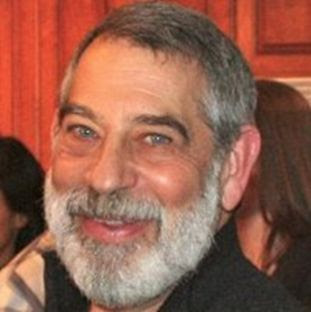 Marty Gottlieb of Smart Pots is coming to speak at Natureworks this Saturday. Gottleib of Smart Pots. He is perhaps the most enthusiastic speaker I have ever met- we joke and say he makes ME look “low key”. 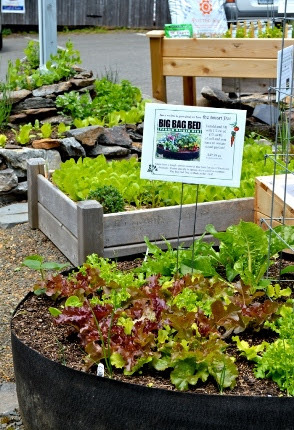 He LOVES to grow food, and lots of it, in Smart Pots and Big Bag Beds. Don’t miss this event, Marty is traveling from far away to share his expertise and knowledge with us. We are honored. BE sure to think of Natureworks if you need special gifts for some of the upcoming holidays. Passover begins at sundown on Friday. Next Wednesday, April 27th, is Administrative Professionals Day. We would love to custom design a miniature desktop garden or terrarium to give as a gift. Consider a garden basket filled with perennials or annuals as a hostess gift. I had someone stop into Natureworks on Saturday who had bought living garden baskets back in the 80’s when we were in Stony Creek. She was THRILLED to find we still make them! With our extended hours, it’s easy to call in advance to order a gift and then pick it up. 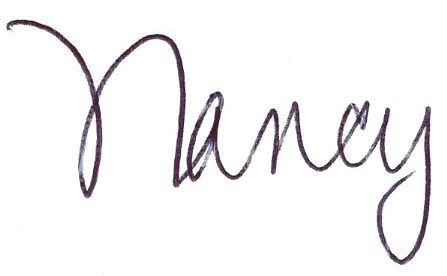 We are open Monday throughSaturday 8-6, Thursday 8-7, and Sunday 9-5. Walk in the woods THIS WEEK and tread carefully. 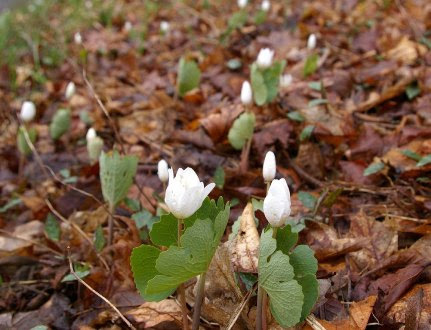 You may find all kinds of wonderful native wildflowers in bloom such as this stand of bloodroot I discovered along the side of the road in Guilford. 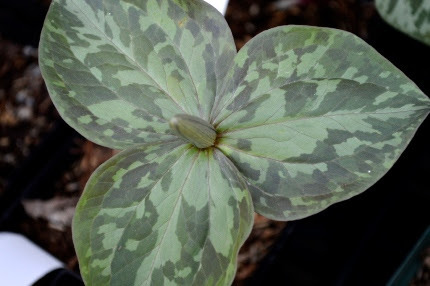 Trillium foliage is beautiful, even before this precious wildflower blooms. of cool plants in bloom and a nice selection that will bloom later and really get well established if you plant them this spring. I went home and wrote a blog post with lots of pretty pictures talking about some of the highlights on our benches right now. To read the Wide World of Wonderful Plants blog post, click here. Geums are such a pretty and underused perennial. 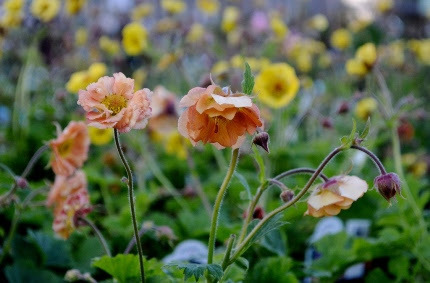 this week is Geum. The May bloomer has gone through quite a breeding transformation. We offer many varieties from the Cocktail Series- flowers named after drinks such as ‘Mai Tai’ and ‘Alambama Slammer’. This week marks the start of our bi-weekly specials. Every two weeks we pick a featured plant and offer it at 20% off. The first sale is on perennial bachelor’s buttons, a plant that looks absolutely stunning with Geums and Oriental poppies. 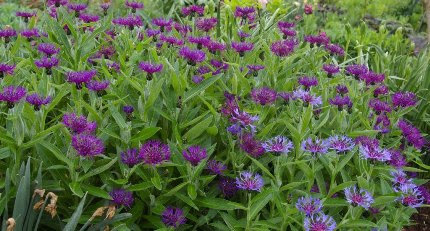 Centaurea montana, perennial bachelor’s buttons, are on sale for the next two weeks. We have blue, purple, “black”, and white with a blue center.